Who will be the next Manchester United manager? 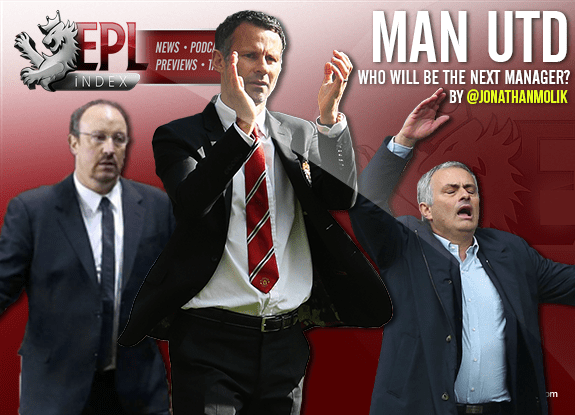 EPL Index > EPL Index Featured Article > Who will be the next Manchester United manager? For months now it has been in speculation who will overtake the job after current manager Louis Van Gaal is rightfully sacked. I think many media personnel and United fans would have thought it would have been sooner but Ed Woodward is adamant in backing LVG. Names like Jose Mourinho and Ryan Giggs have been front runners but there are plenty of other managers that could the job and do a good job. Lets look at all the potential candidates in my opinion and what they bring to the table. First, how can it not be Jose Mourinho. The currently unemployed manager’s last spell was at Chelsea for his much anticipated second coming. During his second spell he captured a Premier League winners medal. After a horrible start to the 2015-2016 campaign seeing them drop as low as 15th, Chelsea sacked Jose Mourinho. Jose is a special case as manager. He has the capability like no other manager to draw all the media attention away from his players and on to him allowing his players to relax and refocus on what they have to do. Jose’s unpredictable counter attacking football makes it hard for teams to plan accordingly to stop his team. Jose Mourinho has already proven his worth in the Premier League and what he is capable and could really do wonders with this United team. The only worry I have is Jose Mourinho doesn’t incorporate youth into his game plans and well if the United injury problems continue, the best players at our club will be our youth. Just look at how many different players LVG has called up. Second, it has to be the man mentioned earlier Ryan Giggs. Ryan Giggs was part of the famous Class of ‘92, arguably the greatest group of youth academy products United will ever produce at one time. He went on to make 672 appearances for United over a 24 year period, scoring 114 times. His first look into the managing world is when he was a player coach under David Moyes and when Moyes was sacked, Giggs was interim manager for the final four games. When LVG was appointed, he didn’t bring much of his own backroom staff so kept Ryan Giggs on as his assistant. I think United fans more than anything are hesitant at this appointment. For one he has no proper managing experience. Secondly he is studying under LVG and should be taking some of the blame for United’s poor performances this season. I also think United fans will be more open to Giggs being appointed manager if Gary Neville succeeds as Valencia manager. A player also from the Class of ‘92, Gary took the Valencia job with no managerial experience and hasn’t had the best of times. United fans are gonna see this and assume the same will happen with Giggs. I guess it is hard to say with certainty if Giggs would succeed as United manager. Thirdly, why is nobody talking about Rafael Benitez? Benitez most recently was sacked at Real Madrid to make way for club great Zinedine Zidane to take charge. Benitez is the only manager to win the Europa League, UEFA Super Cup, Champions League, and the Club World Cup. He was also the first Spanish manager in the Premier League after being appointed manager of Liverpool on June 16th, 2004. Some say his playing style is outdated but his track record alone in Europe is reason to give him a chance. Yes he was 3rd in the Liga BBVA with Real Madrid but Madrid fans and their bored have unusually high expectations where if they don’t win silverware they demand sacking. Benitez is currently rumored for the Newcastle job but I couldn’t see him turning down the United job if offered. Fourthly, Manuel Pellegrini. This summer Manuel will be out of a job after it was announced Pep Guardiola will be taking over as manager of Manchester City. Manuel, like Jose and Benitez, has a very credible record and success rate in the Premier League. I’m just gonna come out and say it, Manuel is tactically incapable of doing nothing. His success at city was due to his roster of world class players and money made available to him. With the transitional period United are in, Manuel probably isn’t the man for the job. Unless he can repeat his Villarreal days, Manuel right now is not the man for the job. Lastly, Brendan Rodgers. The man responsible for where Liverpool are today. The only issue is i have with his appointment is his style of play doesn’t suit the current United roster. Being strong at the back with a lot of midfielders to move the ball continuously. United’s defense has been plagued by injury and unsteadiness the entire season. Now these were only the managers who currently don’t have clubs, of course there are more out there that need to be taken into consideration. Diego Simeone would be a great shout but I can’t see Atletico Madrid parting ways with him. As it stands right now it looks like United has time to find a replacement as LVG is probably gonna see out the season. Categories: EPL Index Featured Article, EPL Index Opinion, Manchester United, and Manchester Utd (NN).' 'Tags: "Manchester United", Benitez, brendan rodgers, DAVID MOYES, Diego Simeone, Gary Neville, Louis Van Gaal, LVG, Man Utd, Manuel Pellegrini, MOYES, MUFC, Pellegrini, Real Madrid, rodgers, and Ryan Giggs. Is Mourinho's second season going to plan? Chelsea's Ruthlessness - Enough to Put Off Other Managers? Will this season be the Battle of the Bosses?